Summary: The 1byone model O00QH-0861 wireless driveway features a low quality PIR sensor that goes off due to sunlight and wind. I recommend the Guardline GL2000 or the Dakota as alternatives. 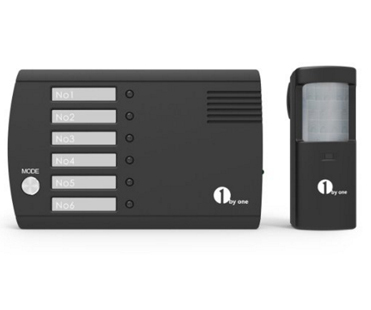 The 1byone model O00QH-0861 will notify you whenever it detects animals, people of vehicles. The box contains 1 receiver, 1 motion sensor, mounting hardware and instructions manual. Batteries are not included. The alarm features a PIR sensor that will pick up movement. Once movement is detected, it will send a signal to the receiver. You will then be alerted by a chime, flashing LED or both. The 1byone model O00QH-0861 has a long 500 feet range and it’s versatile in terms of how many areas you can protect. However, the PIR sensor gets triggered easily by sunshine or wind. Also, the alarm is made with low quality components, and it will not last long. The Guardline GL2000 or the Dakota 2500 are high quality driveway alarms that I strongly recommend.